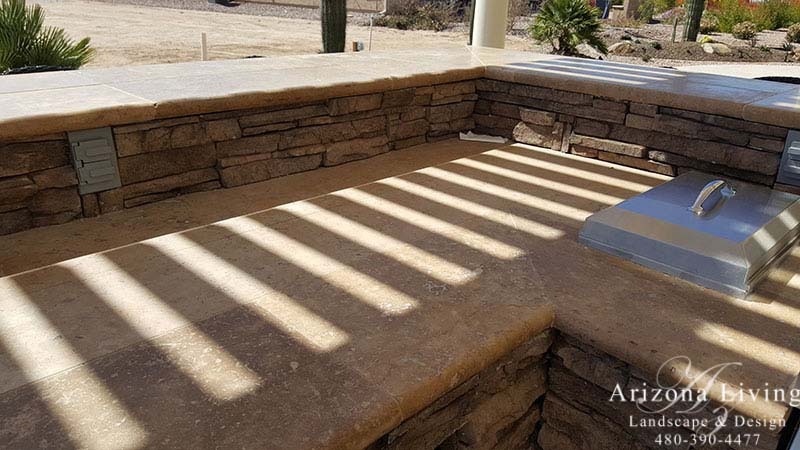 The Our customer in Anthem Merrill Ranch in Florence, Az was looking for a desert landscape that would stand out. It was a fun and challenging experience. 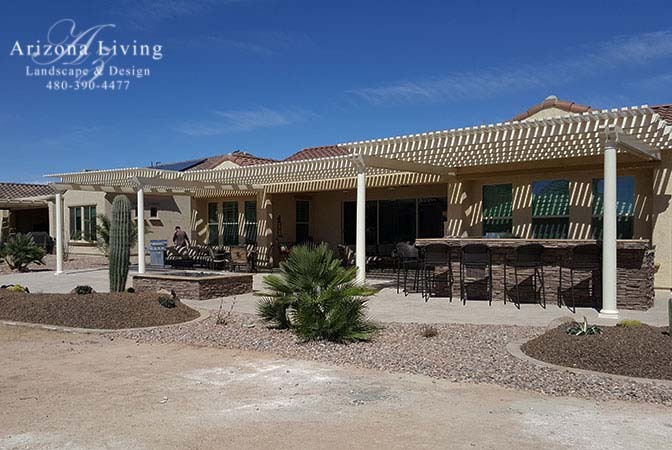 We had to come up with an amazing design that would fit within our Arizona desert with low maintenance and water friendly. 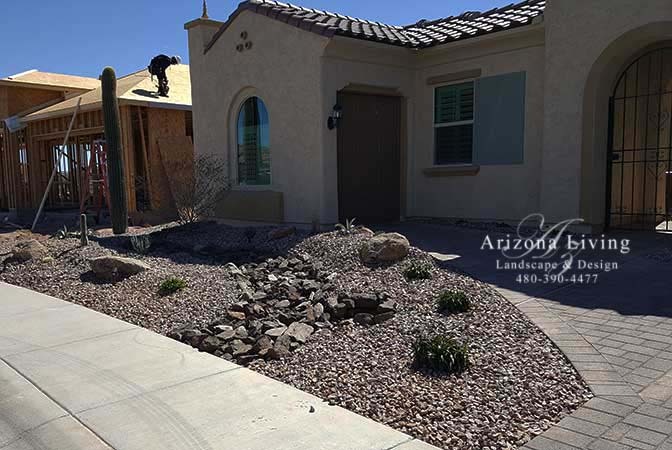 We had a ton of desert landscape ideas we could use for this yard and were up to the challenge. This was a new build so we started with a blank slate. 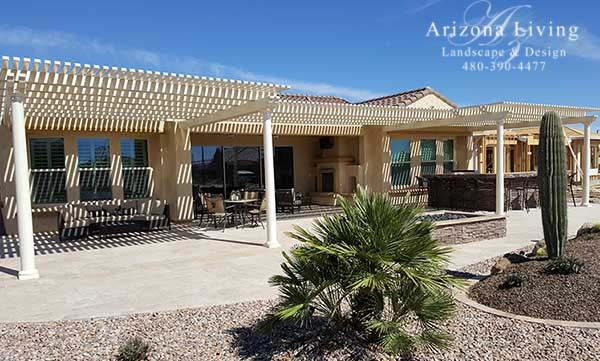 The homeowners wanted a pergola or cover for shade, Built-in BBQ, desert landscape look and feel with desert plant life that was low maintenance, fire pit, and an entertainment area for friends and family. They wanted to be “wowed”! The pergola we had installed was amazing with 3 different sections and beautiful Victorian columns. It provides shade all day from the intense Arizona sun. Off of the back door there is a huge rectangle gas fire pit. We wrapped the sides in cultured stone and capped in travertine bullnose pavers. It is perfect to sit around in the cool Arizona evenings and large enough to fit a group of people around. 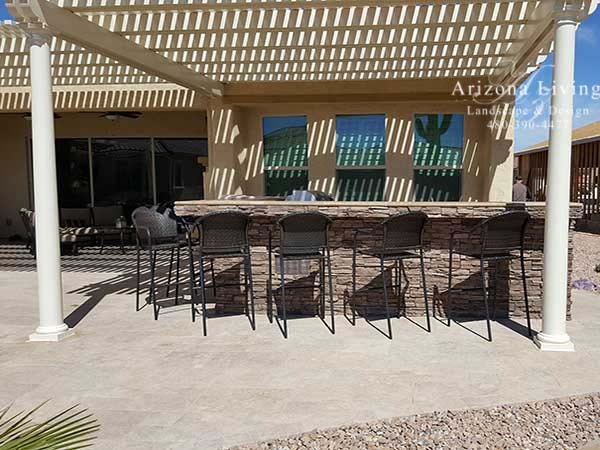 To the one side of the huge travertine paver patio we installed a custom built-in BBQ area with a big side bar to fit several chairs or bar stools. The inside of the built-in BBQ has a sink, big drop in gas grill and fridge. 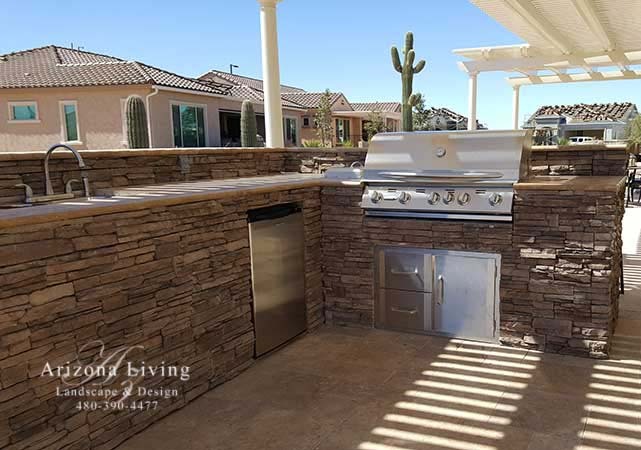 It’s the perfect place to grill and prepare or serve food and drinks. The counter is done in travertine to match the travertine patio. The saguaro cacti we installed were 20+ feet tall with several arms. We installed two in the back yard and two smaller ones in the front yard. The mounding was done in a contrasting rock color. 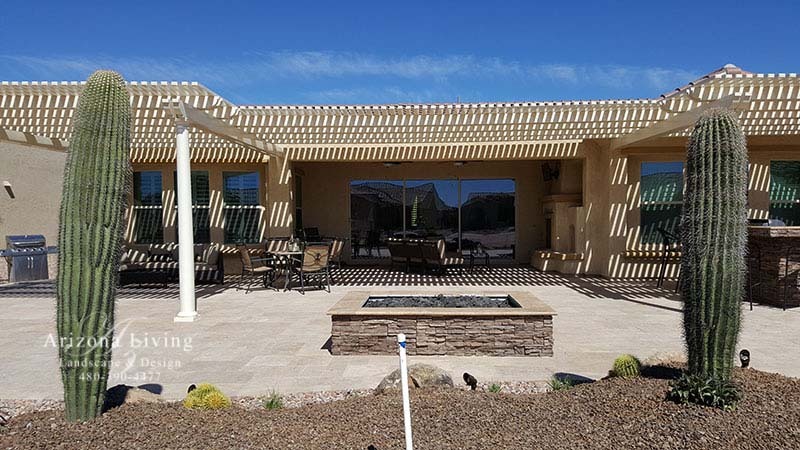 We used Table Mesa Brown 1/2″ and bordered them with the travertine pavers. The front yard was small. We installed a decorative riverbed in 3″- 6″ rip rap with mounding and plants. 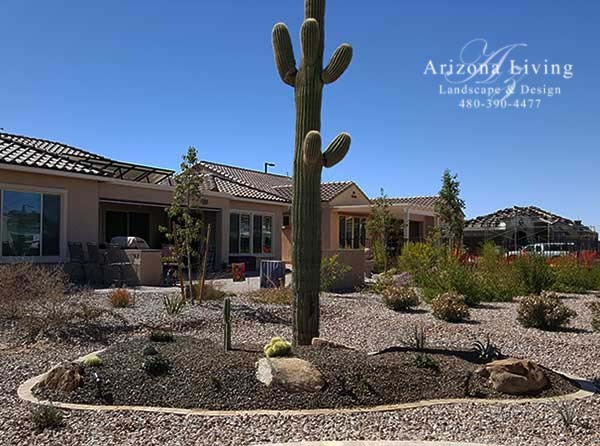 We installed desert adapted plants that require little water and maintenance for a xeriscape landscape. The landscape included a variety of cactus and Agave’s for the desert landscape with some little accent plants to soften the look. We extended out the builder installed pavers to go around the side to a garbage can enclosure. In the end, it turned out to be a show stopper. Once they had their fountain delivered and installed in the backyard, they had their oasis in the desert. If you are looking for more desert landscapes check out our blog category desert landscape ideas.